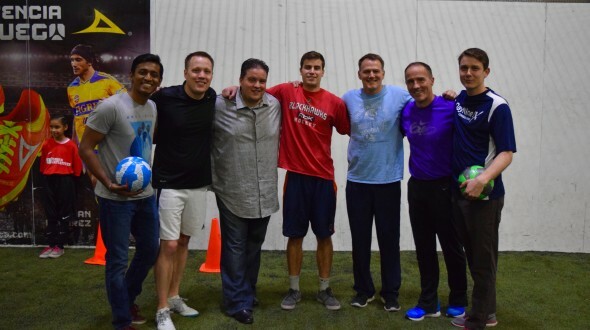 For the last game day of the fall season, Urban Initiatives welcomed a team of Corporate Coaches from DayNine Consulting at Chicago Indoor Sports. The volunteers spent the afternoon working with teams of seven Urban Initiatives soccer players from Providence Englewood Charter School, Tarkington Elementary, Marquette Elementary, and Lee Elementary. After getting loosened up with a few stretches, the coaches and players took the field. From the very beginning, DayNine’s volunteers brought a ton of energy and fun to the games. They cheered as their teams ran up and down the fields, encouraged their players to help each other up and shake hands after fouls, and made sure everyone had a chance to play defense and offense. It was a fantastic afternoon, and as the schools were leaving to board their buses, the players thanked their coaches and gave them high fives. Urban Initiatives would like to thank Brad Jenseen, an amazing Junior Board member, for setting up the event and DayNine Consulting for supporting our work and players!